The wonderfully permanent nature of wrought iron means that, in most cases, it is super-easy to care for. 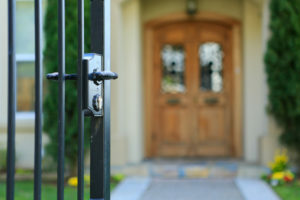 However, due to its slightly course texture, wrought iron can sometimes hold extra dirt and dust and, in the case of outdoor items, inevitably rust. But with a bit of regular cleaning and maintenance, your wrought iron masterpieces will last (literally) forever. Here are some of our handy tips on how to clean wrought iron. The first step in caring for wrought iron is to clean it thoroughly. If you’re looking to clean wrought iron furniture, clear a space preferably outside the house that can handle a bit of water and dirt, as cleaning wrought iron can be a bit of a messy process. If you’re cleaning items inside the house, think about laying down some plastic or a tarp to lessen the mess you’ll have to clean up later! Step 1 – You’ll need to both wash and rinse your wrought iron, so fill two buckets or large spray bottles with warm water – one of these will be used purely for rinsing, so the mixture will only be pure water. If you’re cleaning larger items such as railings or outdoor furniture, a bucket will probably work best, or alternatively if you’re working outside, a hose can be used to rinse off your items. Spray bottles work fine on smaller items. Make sure the water’s not too hot – you don’t want to burn yourself, and wear a pair of rubber gloves to keep your hands clean. Step 2 – Add soap to your water. A mild cleanser like liquid soap or a gentle household cleaner will work fine, however be sure to avoid antibacterial soaps or cleansers that contain bleach as they can damage the wrought iron. If using soap, add 1 tablespoon of soap to around 950mL of water. If using a household cleaner, add ¼ cup to around 1900mL of water. White vinegar can also be used as a milder cleaning option, particularly for your indoor wrought iron items (it probably won’t be strong enough to remove dirt from outside items). Add ½ cup vinegar to around 1900mL of water. Step 3 – Remove all non-wrought iron materials like pillows, coverings and cushions if applicable. If your item is made out of multiple materials, for example, a wooden seat with wrought iron sides, you may not be able to isolate the wrought iron, so just be sure to clean carefully where the two materials meet. Covering the non- wrought iron sections in cling wrap can also help clean these sections dry. Step 4 – Soak a sponge in your cleaning solution and if it’s a larger item, avoid squeezing out the excess water as you’ll need plenty of soapy water to reach every nook and cranny of your item. If you’re cleaning a smaller item and using a spray bottle, just spray a sponge or cloth with the solution until it’s thoroughly wet. Step 5 – Remove dust and dirt by wiping your wrought iron item in a circular motion, working on small sections at a time until it’s fully clean. Re-dampen your cloth or sponge if necessary. Step 6 – Rinse your item by dipping a clean sponge or cloth into your second bucket of water, or using your rinsing spray bottle and a clean cloth and wiping thoroughly. Continue the process until your item’s clean. Refill your bucket if the water becomes too dirty. If you’re washing wrought iron outside, it might be easier to rinse with a hose. Step 7 – Allow the wrought iron to dry completely. Outdoor items can be left to dry in the sun and indoor items should be wiped with another clean cloth until all excess moisture is removed. If you’re wondering how to clean wrought iron that is starting to rust on a piece of outdoor furniture for example, immediately after cleaning your item, file down the rust with sandpaper, a coarse wire brush or a piece of steel wool. Brush away the excess flakes and then re-clean the item following Steps 1 to 7 above, to ensure that any tiny remnants of rust that are remaining are removed. If you have an outdoor item that has a damaged paint finish that is flaking off, you can start the restoration process by sandpapering the piece all over, or consider renting a portable sand blaster that will do the job quickly and easily! Next you’ll need to prepare the surface for refinishing by removing any dust or debris that’s appeared as a result of the sanding process. Rinse off and dry all of the surfaces, then paint on a rust-resistant primer, making sure you coat all of the surfaces evenly. Refinishing the iron surface is the next step, and this can be done with an acrylic latex paint or an oil-based paint that is specifically made for outdoor metal items. This will ensure your item has the ultimate protection from the elements. Paint once, allow to dry thoroughly and then apply a second coat. If spray painting, make sure there is adequate ventilation and you use a drop cloth to prevent paint staining any surfaces. Consistently maintain your wrought iron pieces and they’ll last forever! If you’re wondering how to look after wrought iron in the long-term, you should start with dusting your items on a regular basis with a feather duster or a lint-free microfibre cloth at least once a week. To buff your wrought iron pieces to a shiny finish, use a specially formulated wax product and use a soft cloth to apply it with small circular motions. Allow to dry completely and then use the reverse of the cloth to polish the wrought iron. This will protect it from wear, and in the case of outdoor items, from the harsh Australian elements. Keen to add to your wrought iron furniture collection? Contact the experts at Dean-Wilson Iron on 3814 0076.